A friend is expecting a baby girl in August and asked me to sew a few thing for her nursery. I didn't decorate a nursery for either of my kids to I was excited to help out. I am of living vicariously a little bit, I think I would have a lot of fun designing a whole baby room. 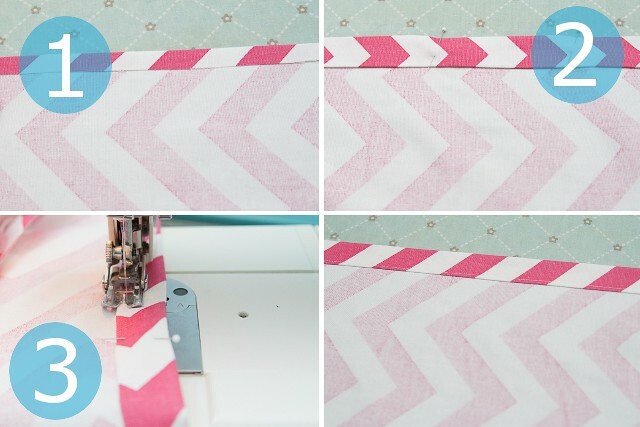 Last week she brought over a giant roll of fabric, 8 yards of hot pink chevron! I couldn't wait to cut into it! First on the list, some curtains. 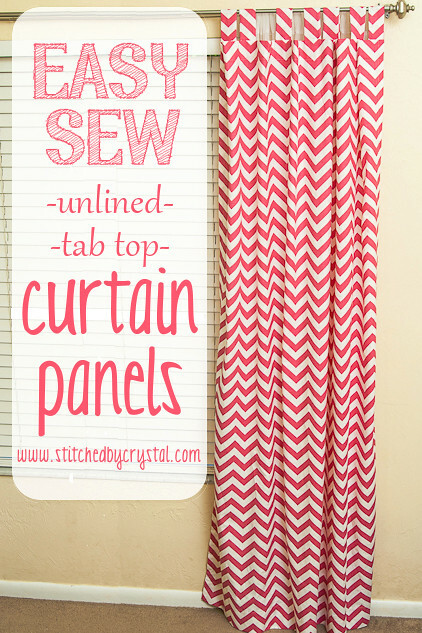 Curtains are super easy to sew, it is all straight lines with the sewing machine. Nothing tricky and no fancy equipment needed. The yellow walls are in my house, they will be going on blue walls in the baby's room. 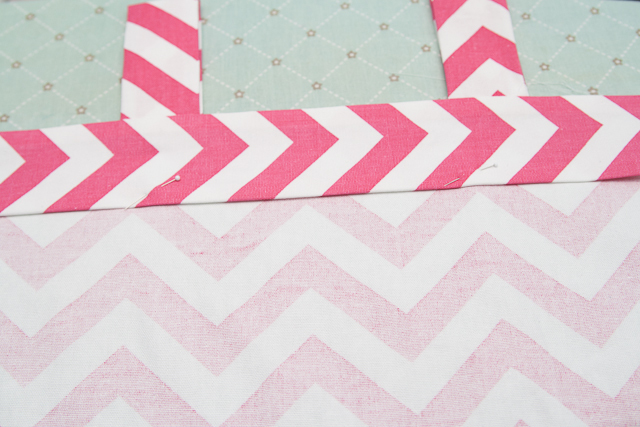 I like the pink chevron print, it works for a baby but can also be used as she gets older. 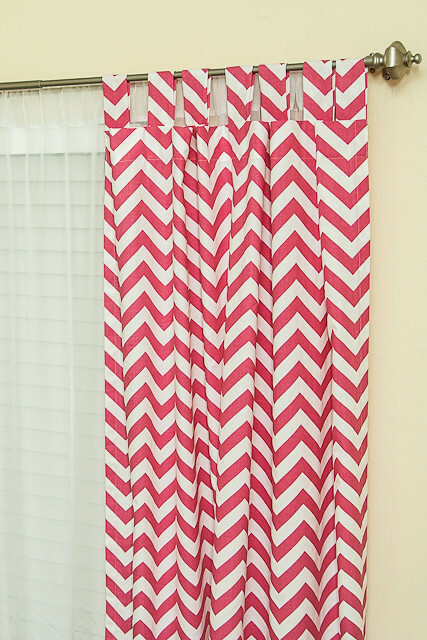 I probably would have even loved pink chevron in my room as a teenager, heck I might hang 'em up now if I thought my husband would go for it! 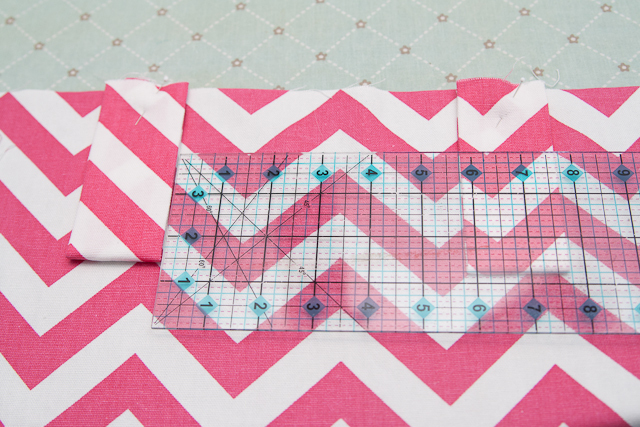 The measurements given in this tutorial are for curtains 48" wide and 84" long. A good rule of thumb when deciding how wide to make your curtains is to make them at 2-2.5 times the width of your window. That way when they are shut they still have a bit of fullness to them. Cut 2 panels 84" x 51". (1) Fold and press the edge 1/2"
Hem the bottom edge of the panel by folding the raw edge up 1/2" and then 3", pressing each time, pin and sew along the folded edge. To make the tabs, cut 14 rectangles that are 9" x 5". 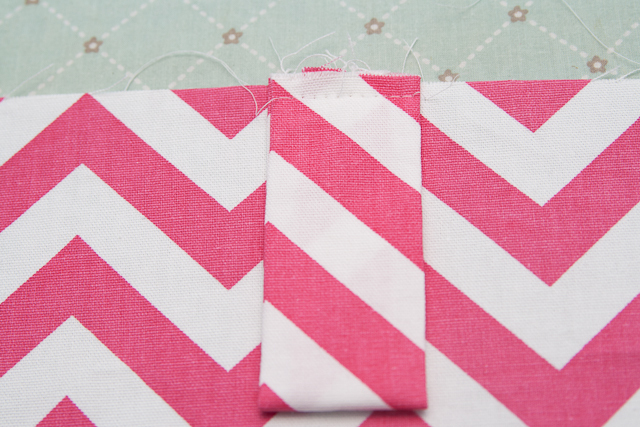 Fold them in half and sew along the edge with 1/2" seam allowance. Turn the tabs right side out and press with the seam in the middle. Fold your tabs in half so the seam is on the inside. Starting with your first tab at the very edge of the curtain, pin 7 tabs evenly across each panel, your last tab should be at the other edge. For 48" curtains put them 5.75" apart. Baste the tabs in place. Cut a strip of fabric that is 49" long and 3.5" wide. 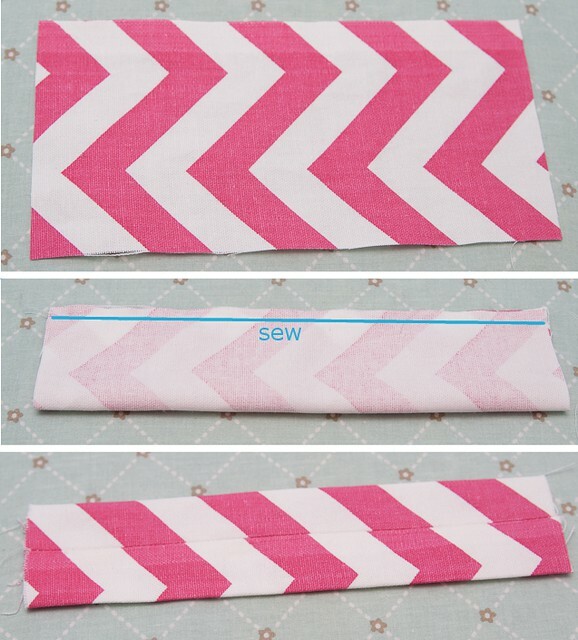 Fold the ends in 1/2". Pin the strip along the top of the panel, sandwiching the tabs in between the layers. Sew along the top edge. 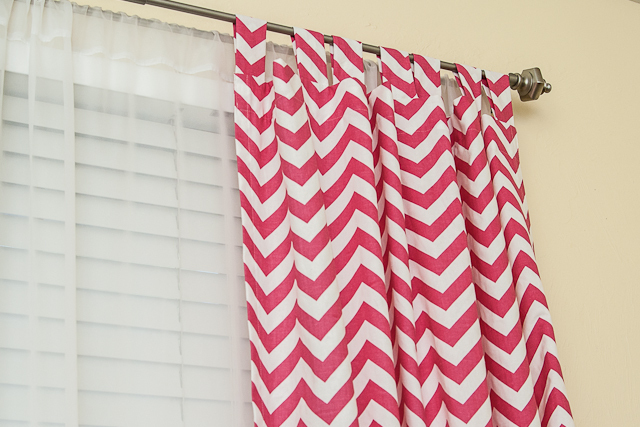 Flip the strip so it is right side up on the back of your curtain. Fold the raw edge under 1/2" and pin in place. 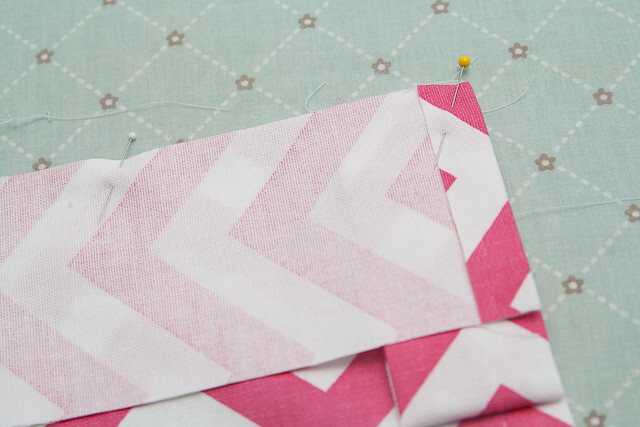 Sew down the three loose edges of the strip along the folded edges. I just bought a sewing machine and plan to make curtains for my three bathrooms (all of which just got new windows)! I also haven't ever replaced the curtains in the bedrooms after doing the windows three years ago (shades were put up!!!) so I would like to make those curtains too! This site has given me the courage to do so! I love this! Can't wait to get started! Thank you for sharing this! I love how simple this project is while still being a large-scale project. Gorgeous! These are very nice piece of sewing. It shows you what can you do with your simple sewing machine and those are really great things if you can do it. Check here more for further information. Good job great efforts thanks for sharing. Wow! Excellent Post. I loved it. Really knowledge sharing. Keep up the work. This is very useful article. if you are looking modern shower curtains for you home purpose. Then you can contact leibona.com for more detail. Sewing machine is required every time for designing the curtains and also for the other purposes. Get this amazing design of curtains from the curtain shops like Watson Blinds and Awnings which has the huge collection of curtains.